There are several Quick Base settings used to support the needs of our customers around the world. Number formats are among these settings. You can set a number format and separator to control how any Numeric field in your app will display. For those of you who are account or app administrators, it isn't necessary to set a number format for every Numeric field. If you have one number format that is used across all Numeric fields in an app, you can set a default value for the app. Likewise, if you only use one number format across all apps in your account, you can set a default value for the account. These defaults affect apps and fields when they are created, so changing them won't affect existing items. These defaults can be overridden on a field-by-field basis. 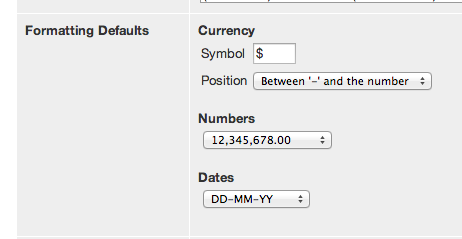 In the Formatting Defaults section, use the Numbers field to choose a number format. Use the Numbers field to enter the number format. New Numeric fields in an app use the app-level property. Custom columns in reports use the app-level property. From the table Home page, click . Under Table Structure, click Fields. Click a Numeric field to display the Field Properties page. Expand the Display section, if necessary. Use the Display Format field to enter the number format. If you chose a number format with number separators, use the Separators field to choose whether the separator will be shown after 3 places or after 4 places. Note: Spaces are not allowed as separators. New Numeric fields created by copying a field use the field-level property of the copied field. Searches on data in Numeric fields ignore the thousands separator. Quick Search and Advanced Search allow the user to search for both formatted and unformatted numbers. Data exported from Numeric fields will include the correct number format. Numeric data imported into existing fields in a table use the field-level property for the number format. If number format information is included in the imported data, it should match the field-level properties of the fields it's being imported into. The ToText(Number n) formula function returns the number with a decimal separator but no other formatting.